depression is possibly of psychotic proportions but the protocol was too guarded to be certain. Mental functioning is clearly fragile. Extent of pathology is evident in borderline features: 1) intrusions or personal concerns into intellectual functioning, 2) primitive fantasy content, e.g. mutilated bodies, masked, distorted figures, concerns about bodily integrity and deformity, 3) inadequate capacity for attachment to other people. Borderline feature number two is, obviously, of special concern to us. Such preoccupations are alarming, and suggest an unusual capacity for violent thought. Later in the report, Dr. Quinlan states: Impulse control is marginally adequate. This point, coupled with borderline features number one and two, suggest Michael may just be pathological enough to sidestep his intellectual functioning. In other words, his rationale could be superseded by the temporary madness of a psychotic episode. If Michael was, as suspected, under the influence of alcohol and drugs on the night of October 30, 1975, the possibility of such a psychotic episode is increased, while Michael's wherewithal to resist it is decreased. Remember, Dr. Quinlan states: The depression is, possibly of psychotic proportions but the protocol was too guarded to be certain. At first, one might take this to mean that Michael himself was too guarded, that he used a certain protocol and/or polite behavior to distance himself from the doctor in a protective manner. Consider the sentence again. Dr. Quinlan says "the'" protocol, not Michael's protocol, or Michael's manner. 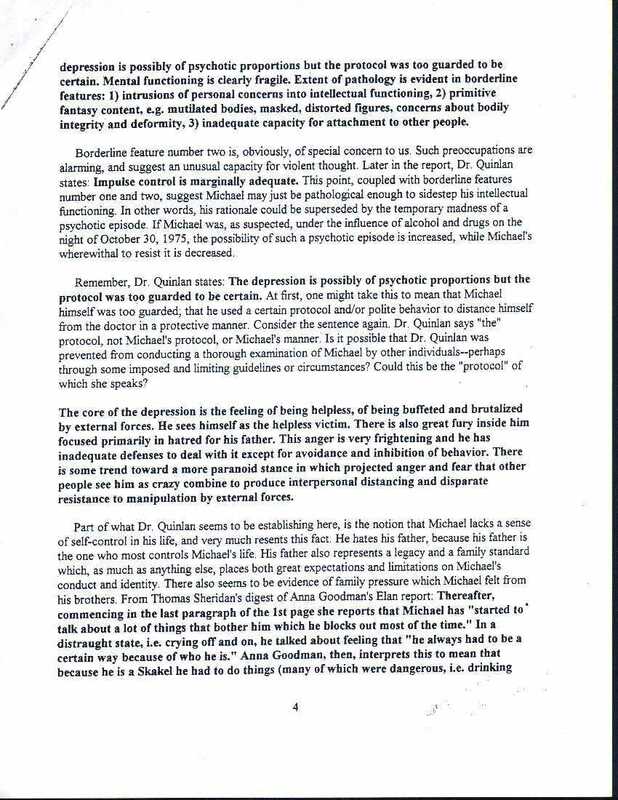 Is it possible that Dr. Quinlan was prevented from conducting a thorough examination of Michael by other individuals--perhaps through some imposed and limiting guidelines or circumstances? Could this be the "protocol" of which she speaks?